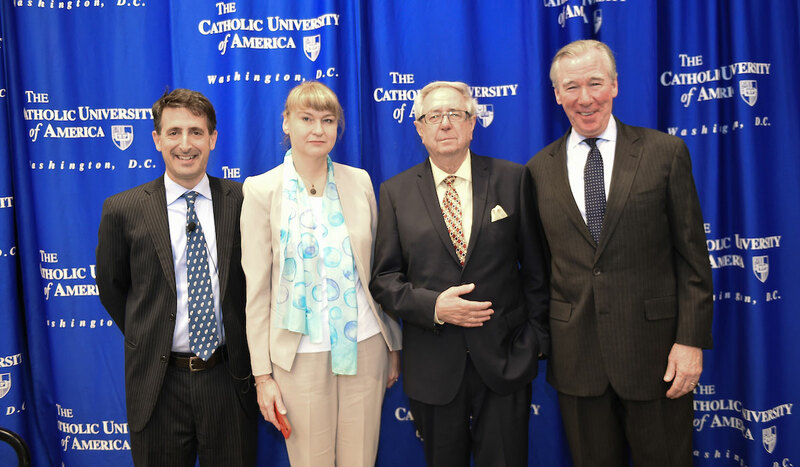 Catholic University professors gathered in the Edward J. Pryzbyla University Center May 1, to honor their own during a faculty luncheon. 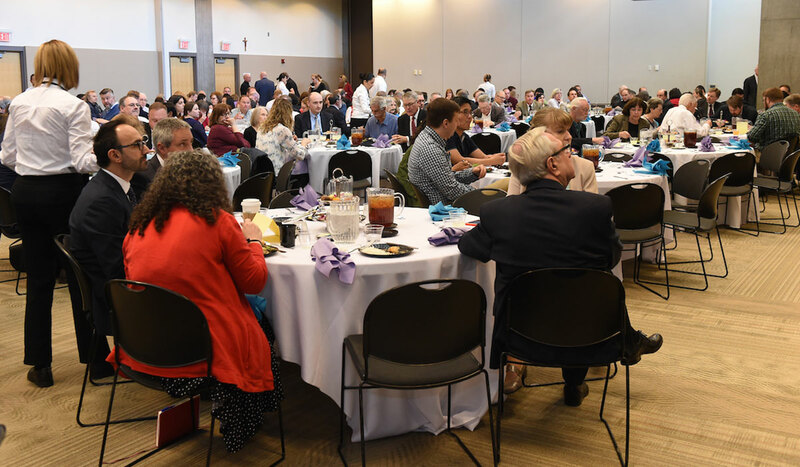 The luncheon, which is held annually, included a brief address from University President John Garvey on the state of the University. 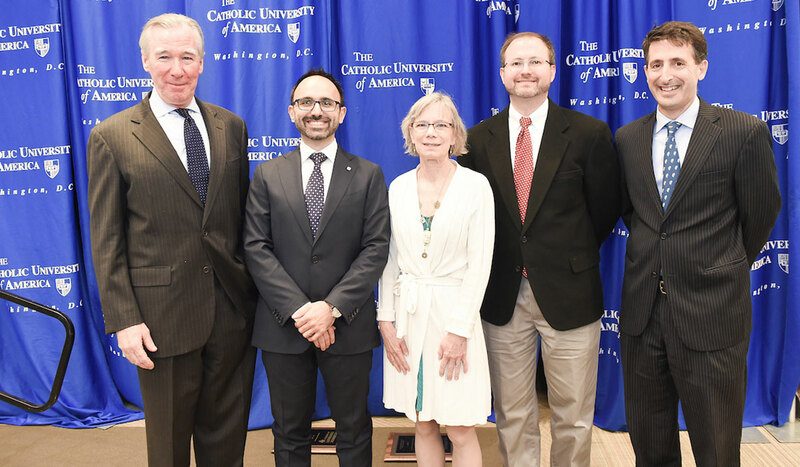 Prior to that, University Provost Andrew Abela called attention to the three faculty members retiring this year: Rev. Regis Armstrong, O.F.M. Cap., and Rev. 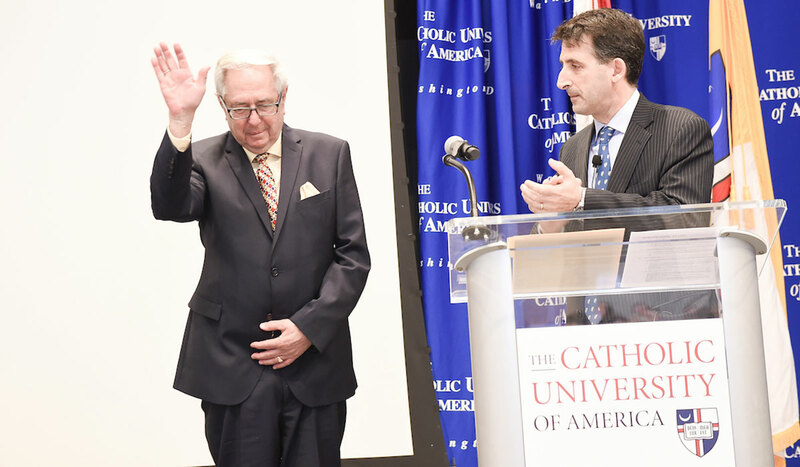 John Ford, C.S.C., both of the School of Theology and Religious Studies (STRS); and Rett Ludwikowski, of the Columbus School of Law. 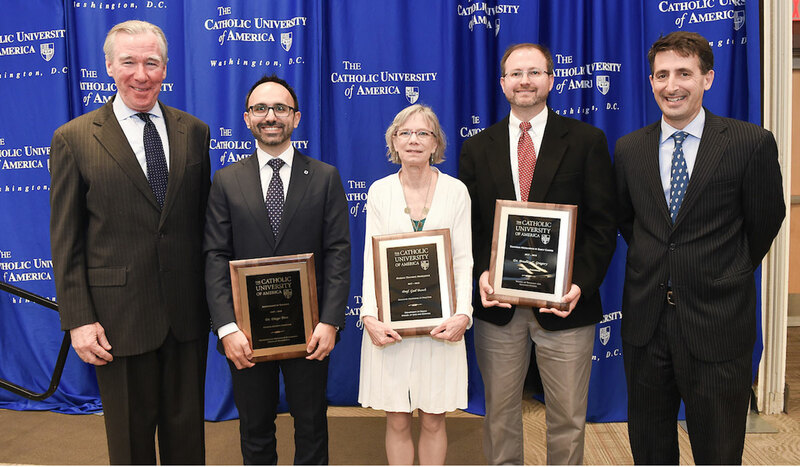 Abela also recognized several faculty members with teaching awards. Diego Turo, who teaches mechanical engineering in the School of Engineering, was awarded the Provost’s Advancement in Teaching Award for “his commitment to improve the department by making fundamental and innovative changes in all the courses he has taught,” Abela noted. Turo, who has been a clinical assistant professor since 2014, serves as the coordinator of the newly established Aerospace Engineering concentration offered to undergraduate mechanical engineering students since 2017. As part of his teaching philosophy, Turo “believes students need to be exposed to computer programming, data acquisition, and analysis in their early career,” Abela said. Abela added that Turo has also been described as “one of the most diligent and valuable faculty members” in the mechanical engineering department. 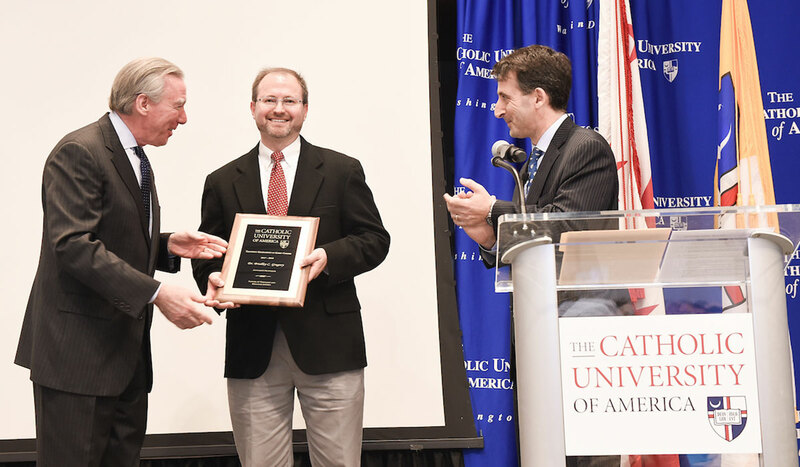 Bradley Gregory, of the School of Theology and Religious Studies, was honored with the award for Teaching Excellence in Early Career. Gregory joined Catholic University in 2014 and has been an associate professor since 2017. He teaches at both the undergraduate and graduate level and is highly regarded by students. “At the graduate level, they applaud him for highly organized teaching that clearly communicates complex topics in text criticism,” Abela said. 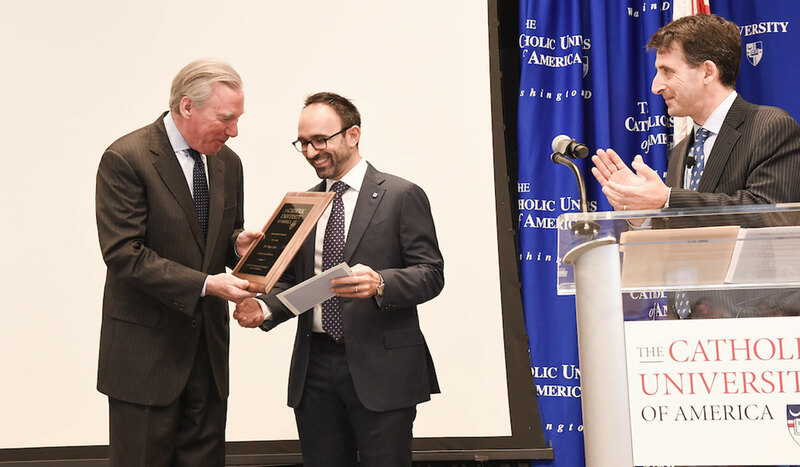 At the undergraduate level, students described Gregory as “a natural born storyteller” and his class as “the best … I have ever taken in my life,” Abela noted. Gail Stewart Beach, of the Department of Drama, was honored with the award for Overall Teaching Excellence. Beach has been a member of the Catholic University faculty for more than 30 years, first as a costume shop supervisor and adjunct faculty member. She has also served as an associate professor, a producer for the Hartke Theatre, and as chair of the drama department from 2007 to 2013. 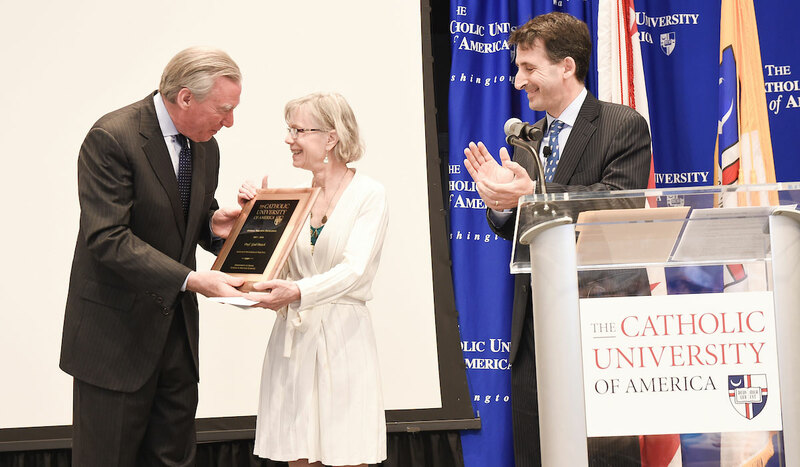 He quoted her nominator in saying that Beach provides a positive example for both her students and colleagues through her tireless work for the department and the University. “By her actions, she has testified that teaching is not confined to the classroom and that our examples of strong meaningful work and dedication to the whole educational experience matter,” he said.